Wahhabism (larabci|الوهابية, lafazi|al-Wahhābiya(h)) wata akida ce kuma da'awar addini Musulunci na salafiyya wanda Muhammad ibn Abd al-Wahhab yafare ta.Template:Efn It has been variously described as "ultraconservative", "austere", "fundamentalist", or "puritan(ical)"; as an Islamic "reform movement" to restore "pure monotheistic worship" (tawhid) by devotees; and as a "deviant sectarian movement", "vile sect" and a distortion of Islam by its opponents. The term Wahhabi(ism) is often used polemically and adherents commonly reject its use, preferring to be called Salafi or muwahhid. claiming to emphasize the principle of tawhid (the "uniqueness" and "unity" of God), for exclusivity on monotheism, dismissing other Muslims as practising shirk, (idolatry). It follows the theology of Ibn Taymiyyah and the Hanbali school of jurisprudence, although Hanbali leaders renounced Abd al-Wahhab's views. Wahhabism is named after an eighteenth-century preacher and activist, Muhammad ibn Abd al-Wahhab (1703–1792). He started a reform movement in the remote, sparsely populated region of Najd, advocating a purging of such widespread Sunni practices as the veneration of saints and the visiting of their tombs and shrines, that were practiced all over the Islamic world, but which he considered idolatrous impurities and innovations in Islam (Bid'ah). Eventually he formed a pact with a local leader, Muhammad bin Saud, offering political obedience and promising that protection and propagation of the Wahhabi movement meant "power and glory" and rule of "lands and men". The "boundaries" of Wahhabism have been called "difficult to pinpoint", but in contemporary usage, the terms Wahhabi and Salafi are often used interchangeably, and they are considered to be movements with different roots that have merged since the 1960s. However, Wahhabism has also been called "a particular orientation within Salafism", or an ultra-conservative, Saudi brand of Salafism. Estimates of the number of adherents to Wahhabism vary, with one source (Mehrdad Izady) giving a figure of fewer than 5 million Wahhabis in the Persian Gulf region (compared to 28.5 million Sunnis and 89 million Shia). The majority of Sunni and Shia Muslims worldwide disagree with the interpretation of Wahhabism, and many Muslims denounce them as a faction or a "vile sect". Islamic scholars, including those from the Al-Azhar University, regularly denounce Wahhabism with terms such as "Satanic faith". Wahhabism has been accused of being "a source of global terrorism", inspiring the ideology of the Islamic State of Iraq and the Levant (ISIL), and for causing disunity in Muslim communities by labelling Muslims who disagreed with the Wahhabi definition of monotheism as apostates (takfir) and justifying their killing. It has also been criticized for the destruction of historic shrines of saints, mausoleums, and other Muslim and non-Muslim buildings and artifacts. ↑ 2.0 2.1 2.2 2.3 "Analysis Wahhabism". PBS Frontline. Retrieved 13 May 2014. "For more than two centuries, Wahhabism has been Saudi Arabia's dominant creed. It is an austere form of Sunni Islam that insists on a literal interpretation of the Quran. Wahhabis believe that all those who don't practice their form of Islam are heathens and enemies. Critics say that Wahhabism's rigidity has led it to misinterpret and distort Islam, pointing to extremists such as Osama bin Laden and the Taliban. Wahhabism's explosive growth began in the 1970s when Saudi charities started funding Wahhabi schools (madrassas) and mosques from Islamabad to Culver City, California." ↑ Schwartz, Steven. "Saudi Arabia and the Rise of the Wahhabi Threat". meforum. Retrieved 24 June 2014. ↑ Kampeas, Ron. "Fundamentalist Wahhabism Comes to U.S.". Belief.net, Associate Press. Retrieved 27 February 2014. ↑ 5.0 5.1 "Wahhabi". Encyclopædia Britannica Online. Retrieved 12 December 2010. ↑ 6.0 6.1 Commins, David (2006). The Wahhabi Mission and Saudi Arabia. I.B. Tauris. p. vi. ISBN 9781845110802. ↑ 7.0 7.1 Valentine, Simon. Force and Fanaticism. Oxford University Press. pp. 16–17. Retrieved 24 July 2016. "The majority of mainstream Sunni and Shia Muslims worldwide would strongly disagree with the interpretation of Wahhabism outlined above. Rather than see Wahhabism as a reform movement, many Muslims would reject it in the strongest terms as firqa, a new faction, a vile sect." ↑ DeLong-Bas, Natana J. (2004). Wahhabi Islam: From Revival and Reform to Global Jihad (First ed.). Oxford University Press, USA. pp. 123–24. ISBN 0-19-516991-3. "Wahhabism has become [...] a blanket term for any Islamic movement that has an apparent tendency toward misogyny, militantism, extremism, or strict and literal interpretation of the Quran and hadith"
↑ Commins, David (2009). The Wahhabi Mission and Saudi Arabia. I.B.Tauris. p. ix. "Thus, the mission's devotees contend that 'Wahhabism' is a misnomer for their efforts to revive correct Islamic belief and practice. Instead of the Wahhabi label, they prefer either Salafi, one who follows the ways of the first Muslim ancestors (salaf), or muwahhid, one who professes God's unity." ↑ Michael Sells, Professor of the History and Literature of Islam and Comparative Literature, University of Chicago, Wahhabist Ideology: What It Is And Why It’s A Problem. 12 December 2016. ↑ Commins, David (2006). The Wahhabi Mission and Saudi Arabia. I.B.Tauris. p. 7. ISBN 9780857731357. "The Wahhabi religious reform movement arose in Najd, the vast, thinly populated heart of Central Arabia." ↑ "Wahhabi". GlobalSecurity.org. 27 April 2005. Archived from the original on 7 May 2005. Retrieved 10 May 2008. ↑ Glasse, Cyril (2001). The New Encyclopedia of Islam. AltaMira Press. p. 469. "A sect dominant in Saudi Arabia and Qatar, at the beginning of the 19th century it gained footholds in India, Africa, and elsewhere." ↑ 20.0 20.1 Izady, Mehrdad (2014) . 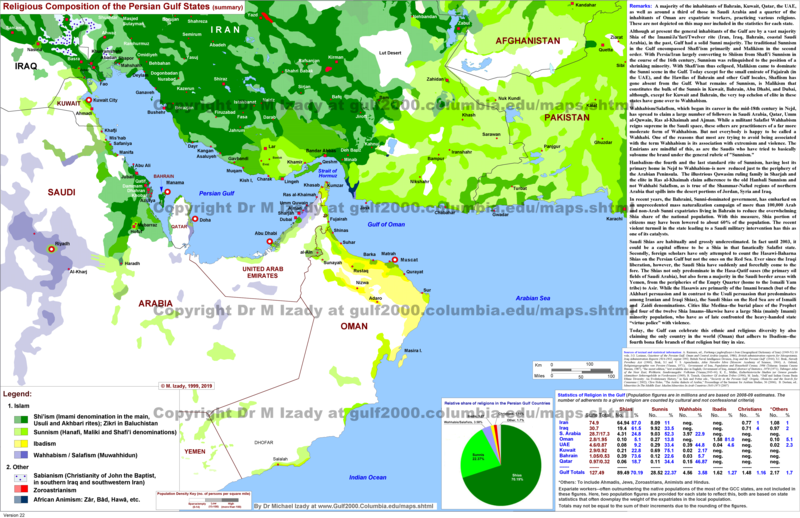 "Demography of Religion in the Gulf". Mehrdad Izady. ↑ Kepel, Gilles (2002). Jihad: The Trail of Political Islam. I.B.Tauris. p. 61. ISBN 9781845112578. "... the financial clout of Saudi Arabia [that] had been amply demonstrated during the oil embargo against the United States, following the Arab-Israeli war of 1973. This show of international power, along with the nation's astronomical increase in wealth, allowed Saudi Arabia's puritanical, conservative Wahhabite faction to attain a preeminent position of strength in the global expression of Islam." ↑ Abou El Fadl, Khaled (2005), The Great Theft: Wrestling Islam from the Extremists, Harper San Francisco, pp. 70–2. ↑ DAOUD, KAMEL (16 November 2017). "If Saudi Arabia Reforms, What Happens to Islamists Elsewhere?". New York Times. Retrieved 16 November 2017. ↑ Stephane Lacroix, Al-Albani's Revolutionary Approach to Hadith. Leiden University's ISIM Review, Spring 2008, #21. ↑ (Salafism has been termed a hybridation between the teachings of Ibn Abdul-Wahhab and others which have taken place since the 1960s) Stephane Lacroix, Al-Albani's Revolutionary Approach to Hadith. Leiden University's ISIM Review, Spring 2008, #21. ↑ "Washington Post, For Conservative Muslims, Goal of Isolation a Challenge". Retrieved 13 November 2014. ↑ John L. Esposito. What Everyone Needs to Know About Islam. Oxford University Press. p. 54. ISBN 9780199794133. ↑ Valentine, Simon. Force and Fanaticisim. Oxford. p. 17. Retrieved 25 October 2017. Offline, ulema, such as those at the prestigious Al-Azhar University in Cairo (the Oxford University of the Sunni Muslim World) similarly, regularly denounce wahhabism as 'a satanic faith which has led to division, debate, dishonesty and mistrust of muslims'. ↑ Haider, Murtaza (22 July 2013). "European Parliament identifies Wahabi and Salafi roots of global terrorism". Dawn.com. Retrieved 3 August 2014. ↑ "Terrorism: Growing Wahhabi Influence in the United States". US GPO. 26 June 2003. "Journalists and experts, as well as spokespeople of the world, have said that Wahhabism is the source of the overwhelming majority of terrorist atrocities in today's world, from Morocco to Indonesia, via Israel, Saudi Arabia, Chechnya. Jon Kyl, US Senator for Arizona"
↑ Commins, David (2006). The Wahhabi Mission and Saudi Arabia. I.B.Tauris. p. vi. "[T]he pivotal idea in Ibn Abd al-Wahhab’s teaching determines whether one is a Muslim or an infidel. In his opinion, Muslims who disagreed with his definition of monotheism were not heretics, that is to say, misguided Muslims, but outside the pale of Islam altogether"
↑ Mouzahem, Haytham (20 April 2013). "Saudi Wahhabi Sheikh Calls on Iraq's Jihadists to Kill Shiites". Al-Monitor. al-monitor. Archived from the original on 24 August 2014. Retrieved 18 August 2014. ↑ Rabasa, Angel; Benard, Cheryl (2004). "The Middle East: Cradle of the Muslim World". The Muslim World After 9/11. Rand Corporation. p. 103, note 60. ISBN 0-8330-3712-9. ↑ Howden, Daniel (6 August 2005). "The destruction of Mecca: Saudi hardliners are wiping out their own heritage". The Independent. Retrieved 21 December 2009. Anyi gyaran ƙarshe na wannan shafi a ranar 5 ga Faburairu, 2019, da ƙarfe 21:09.